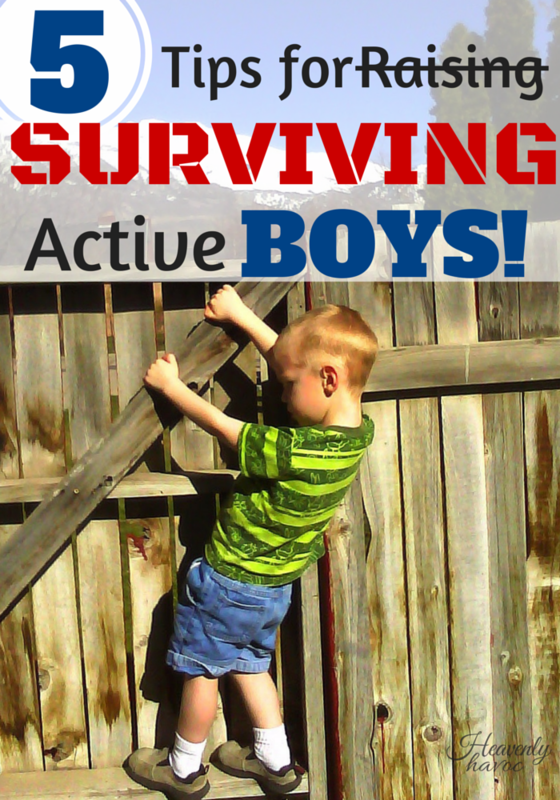 When it comes to raising active boys, it’s survival of the fittest!! Where is the cornstarch? Anyone?? And who is the culprit?? 4-year-old drives van through garage. THAT was fun to report to the insurance company! 1. Keep them BUSY. My son’s brain just goes and goes non-stop. If he has things to do, he does great. When he gets bored, not-so-great things happen and that’s when I start to pull my hair out. You might want to keep a running list of things you know your boys like to do, cause you’ll need it…constantly! 2. Keep them ACTIVE. Outside, outside, Sports, sports, run, run, and whatever wears the heck out of them. If they are active, they’re much less prone to be couch potato video playing zombies. Oh yeah! Make sure you hide your tampon box too, or they might just get used as torpedos!…and then fake claws. :)LOL! 5. Keep a journal! Don’t follow my bad example! I have lots of pictures but I wish I had written down all the funny stories that were not funny at the time but would be NOW! 6. I know I said 5 tips but this one has to be included too. Love them! When I get angry because one of my boys just destroyed something or is driving me nuts, I try to remember that it’s not necessarily because they are bad kids that they act the way they do. They are just very active spirits in little bodies that are still exploring the world around them. I absolutely love my boys and the joy that has come from being their mom far exceeds the stress from trying to raise them. I know someday they will grow up and be gone raising families of their own (hopefully with their own crazy boys!) and I will miss them beyond belief! Thank goodness for boys and the mothers who are trying their best to raise them!